Look at the spec lists of many USB audio interfaces, and you’re more likely to see USB 2.0 as a connection protocol, rather than the more recent USB 3.0 - and you might be wondering why that is. There’s a myth that USB 3.0 is ‘one better’ than USB 2.0, but while it may offer greater bandwidth than USB 2.0, it doesn’t offer any round trip latency benefits over 2.0 - in other words, it’s not going to lower your latency. To indulge in a little tech talk, that’s down to the way computer driver stacks handle USB audio data - the stack schedules data transfers to and from audio drivers at millisecond frame intervals. So, it doesn’t matter how fast data moves over the USB bus; the computer stack determines the limit on minimum latency. Put another way, imagine a delivery service began using larger vehicles to transport mail; sure, they could get more on each delivery, but it wouldn’t get the packages to their destinations any quicker. 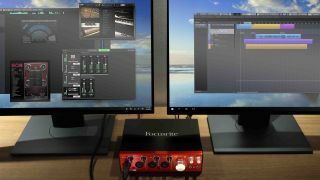 That’s why most modern audio interfaces, such as Focusrite’s newly released Clarett USB range, stick to USB 2.0, rather than USB 3.0 - even on advanced 18-channel interfaces, USB 2.0 provides more than enough bandwidth to handle your recording needs. Plus, USB 2.0 interfaces work just fine with USB 3.0 ports, but the same can’t be said for the reverse - there’s compatibility to think about, too. So, unless you’re planning on running a monster 100-channel-plus recording rig, don’t go scouring spec sheets for USB 3.0; USB 2.0 remains perfectly efficient and more than capable tech for pro recording using audio interfaces.